If you are like most people you probably think parsley is only used to garnish a dish, but parsley has many health benefits and a good way to make the most of them is to drink parsley tea. Parsley, known as Petroselinum crispus, has been used for over 2000 years as an herbal remedy. In fact, it was used to treat ailments before it was ever used as a food. Parsley has all kinds of uses and parsley tea is one of the easiest ways to ingest the herb. While parsley is sometimes used as a seasoning and to give color to food dishes, it can also be used in sandwiches, soups, stews, breads, salads, casseroles, and meat dishes. Parsley contains all sorts of antioxidants, beta carotene, vitamin C, vitamin B12, calcium, folate, chlorophyll, and other nutrients. When you make parsley tea, it is the leaves that are used and not the seeds. While the seeds can be used for some health conditions, such as those causing joint swelling, arthritis and rheumatism, the seeds can cause some serious problems for anyone who is pregnant. This can even include damaging the fetus or causing it to abort. So, if you are pregnant, be very careful of your use of herbal teas and make sure stay away from parsley seeds. Parsley tea can be made with dried parsley leaves. 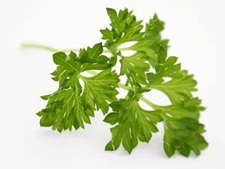 An easy method is simply to pour a cup of boiling water over two teaspoons of dried parsley. Let it sit for at least a half an hour. Then it is ready to drink. You can sweeten it with honey and add a bit of lemon if desired. Because parsley has been around for so long, there are many benefits that have been attributed to it over the years. Parsley is said to help digestion because it has a very high amount of enzymes which improve the digestion of both fats and proteins. It is equally effective on all types of kidney problems. That’s because one of things it does is push debris out of the kidneys, bladder and liver. There is only one kidney problem it does not seem to help, and that is very bad kidney inflammation. Other benefits from drinking parsley tea include improving anemia, eliminating diarrhea, improving cholesterol levels (contains antioxidants), ending fatigue and dissolving gallstones. Parsley is very high in iron and other minerals, such as potassium, calcium, sulfur, manganese. Parsley has many positive effects for women, including improving the regularity of menstrual periods and helping with PMS. It also contains fatty acids which help to balance hormones and can help women who are experiencing the effects of menopause. Parsley tea can give you such other parsley benefits as boosting your immune system. Parsley has more vitamin C than citrus fruits, plus it contains vitamin B12, essential fatty acid, beta carotene, and chlorophyll. The chlorophyll in parsley is both anti-fungal and anti-bacterial and contains oxygen. This can help clear mucus out of lungs and provide virus protection. These are just a few of the many benefits of parsley. If you have never bought parsley before, always pick out parsley that looks crispy and fresh and is dark green in color. Don’t buy parsley with yellowing or wilted leaves. You can store parsley in the refrigerator in a plastic bag for up to a week. Always wash parsley just before you are going to use it. It is exactly like cleaning spinach. You need to continually push it up and down in a bowl of water to get all of the dirt and grit out. You will have to continually replace the dirty water with clean water until the water stays clean after rinsing the parsley. You can dry the parsley for tea by chopping it up, placing it in one layer on a cookie sheet and then leaving the parsley in a warm spot. You should stir the parsley so that all pieces dry equally.